Home › Cool Zingers 100 Watt Police Siren 5 Sound Emergency Vehicle Warning Speaker .. Cool Zingers 100 Watt Police Siren 5 Sound Emergency Vehicle Warning Speaker ..
Comes with pre-wired microphone with push to talk button. Made and sold exclusively by Cool Zingers. 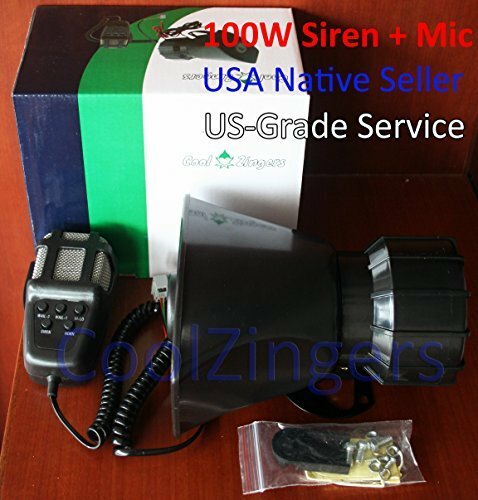 This 100W Cool Zingers Siren can be heard blocks away with this loud 100 watt siren system. With 5 siren tones and PA microphone. This kit include a 100 watt speaker. Also included is a solid state microphone assembly for clear voice commands. This siren kit will work on any 12v System. Instructions included on the box. Installation instructions: Connect the RED wire to a 12v source (inline fuse included). Run the BLACK wire to a ground (or negative battery post). With very large vehicles, the installer may need to purchase additional wiring to elongate the wires. Typical install time is less than a 1 hour. Check your local laws; it may be illegal for this siren to be installed in unauthorized vehicles.